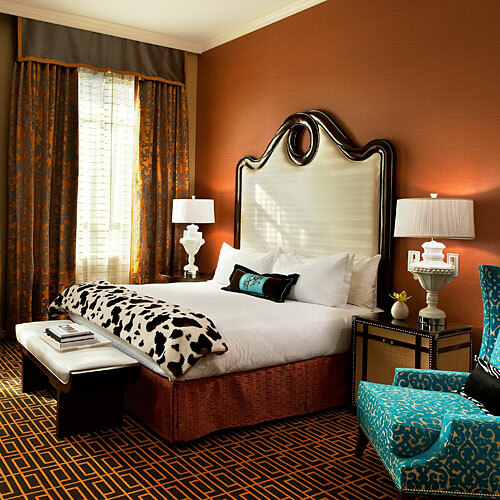 Bright, bold colors mixed among contrasting patterns, from paisley to cow hide—a signature Kimpton style—make the unconventional rooms in this downtown hotel some of the most desirable in town. The complimentary daily wine hour held in the elaborate lobby, the pet-friendly policy, and leopard-print robes in each room don’t hurt either. A 24-hour fitness center, salon and spa, and KimptonKids program round out the offerings. Forgot something? No problem—the hotel will bring you toothpaste, a phone charger or other things you might need free of charge. 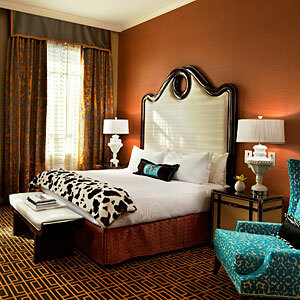 Indulge in the Monte Carlo or Mediterranean Suite on the seventh-floor suite for the fanciest digs in the house.